I seldom buy or try any new make-up products. I keep myself to my oldies goldies - quality products that do the trick. You know what you get each time, when you buy another one. But today I bought a hair mascara. Maybe it was Friday mood or something. A hair mascara (!?) Okay, it was not the best product I´ve used (hair gets a little sticky after use), but I think the color is kind of cool. I could party with this hair for one night. Easily. Have a nice night! Ihanat pinkit latvat. Minä menin ja ihastuin siniseen mascaraan. I wish I wasnt so dark haired. Arvoin kanssa pinkin ja sinisen välillä - se olis myös makee! 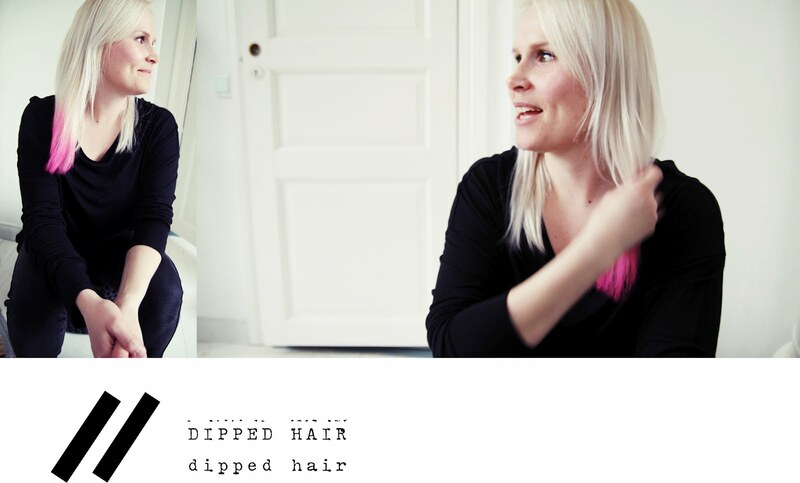 I found this via some blog :) Try to google with "dipped hair", I believe that these colors work for darker hair too? Osanotot! :D Pinkki näytti hauskalta myös letitetyssä tukassa! In Finland this is sold at least in bigger markets. I hope you find one - try webshops? Sorry, I saw from your profile that you are from Finlandia - try Emotions store (SOKOS), or Anttila or Citymarket. They should have it!